Kelsey Paras, DVM, MS, the Elanco Resident in Veterinary Parasitology, grew up outside of Cleveland, Ohio before attending college at the University of Delaware, graduate school at Oklahoma State University, and veterinary school at The Ohio State University. Dr. Paras aspired to be a veterinarian from a young age and became interested in food animal medicine while working on the farm at the University of Delaware. Her MS research on Dirofilaria immitis in coyotes and mosquitoes sparked her interest in veterinary parasitology. Dr. Paras' research with Dr. Ray Kaplan at University of Georgia will focus on anthelmintic resistance and diagnostic techniques of gastrointestinal nematodes in ruminants. 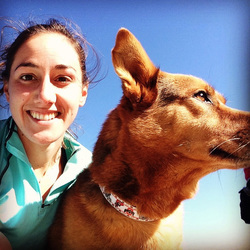 In her free time, Kelsey enjoys traveling, hiking with her dog, Stella, and lifting weights. I grew up in outside of Cleveland, Ohio with my two sisters. My parents encouraged me to pursue my love of animals and allowed us to have several dogs, chickens, rabbits, and one cat. I did not grow up on a farm, so my first large animal experience was in college at the University of Delaware. My bosses there were incredible in helping me learn about cattle and sheep production and sparked my interest in food animal medicine. I further cultivated this interest in veterinary school through elective courses and summer externships, including working with the Nuñoa Project on alpaca health and reproduction in Peru. I have aspired to become a veterinarian from a young age. I enjoyed collecting reptiles and amphibians, observing bird nests, and playing with our pets, especially our cat, as a child. I had originally wanted to become a small animal veterinarian, but after working at the University of Delaware farm with cattle, sheep, and horses and The Ohio State University dairy, I knew that I wanted to work with livestock species. I majored in entomology in undergrad and had the opportunity to take a medical and veterinary entomology course during my sophomore year. I became very interested in diseases vectored by insects, ticks, and mites. Following my undergraduate degree, I pursued an MS in entomology at Oklahoma State University. I studied heartworm epidemiology including the vector composition of the parasite in suburban and rural Oklahoma as well as prevalence of the disease in coyotes. I was convinced at the beginning of veterinary school that I would go into private practice, but a research project in Kenya studying tick borne disease in cattle reminded me of why I enjoy research and parasitology. What focus have you have chosen for your residency? Where will your research efforts be directed? While working on university farms at University of Delaware and The Ohio State University, I discovered my love of food animals. I have chosen to study anthelmintic resistance and diagnostic techniques of gastrointestinal nematodes of ruminants because I want to be a part of increasing knowledge about food animal parasites and the quality of veterinary medicine practiced for these animals. I have just started my residency at University of Georgia, so I am not entirely what I hope to do after graduation. I have been enjoying working with the second year veterinary students in their parasitology course, assisting in the diagnostic lab, and consulting with veterinarians on difficult parasite cases. Basically I am enjoying all aspects of parasitology at this point, so it will take me more time to focus on exactly what I want to do with my career.